Have you noticed tubes of herb paste in the fresh produce department of your grocery store and wondered if there was an advantage to using an herbal paste over fresh or dried herbs? The truth is it’s not really a matter of better or best. Herbal pastes complement the more traditional fresh-or-dried approach. Even though dried herbs are still a great option for cooking, the flavor profile of plants does change once they are dry. Sometimes, then, what you really want for a recipe is a bit of something fresh. Unfortunately, fresh herbs don’t stay fresh very long! Generally, you can extend the life of fresh cut herbs by standing them upright in a cup of water in the refrigerator. But what if you have a bumper crop of an herb and know you won’t be able to use it all in time? You could dry it, but drying herbs takes time and space. That’s where herb pastes come in. They are quick to prepare and take up very little space once they are finished, plus you get the benefit of fresh herb flavor. We highlighted herbal paste in the winter edition of The Herbarium’s Cooking with the Seasons ebook, but we loved the versatility and simplicity of this project and wanted to expand on it even more. So let’s take a look at how to make herb paste, and also at the traditional health benefits associated with some of the herbs that work well for this project. Place the herbs into a food processor and pulse until the herbs are chopped fine. Continue to process the herbs as you add a drizzle of olive oil until the texture is a smooth paste. Once your paste has reached the desired consistency, you can store it in the refrigerator for up to two weeks or freeze it in ice cube trays for later use. No ice cube trays? No worries. You can also freeze your paste by spreading it onto a cookie sheet or baking pan lined with wax or parchment paper. Before you pop the pan into the freezer, use a butter knife to score the paste into squares that will be easy to break apart once it’s frozen. After freezing, place your cubes or squares into labeled zip top baggies or airtight containers. Herb pastes are a versatile condiment that you will love to experiment with. They can be used in both hot and cold foods, so have fun! However you end up using them, you will be adding antioxidants, extra nutrients, and fantastic flavors to your dishes. The herbs often used in herb pastes are well known kitchen herbs. Even though pastes are a slightly less common way to cook with herbs, they’re still just a new take on old favorites. Many of them, though, have secret lives as unusual and useful teas to support your health. Whether you are enjoying them as a tea or a paste, basil, oregano, and lemon balm have some of the most versatile health applications of all the herbs in our list above. For more great info on parsley, be sure to check out our article about bouquet garni. Outside of its uses in the kitchen, herbalists know that basil can help deal with intestinal cramps, nausea, and gas thanks to its carminative properties. It’s beneficial for the lungs, too, and can provide a welcome respite from cough- and cold-related congestion in the lungs and sinuses. Garden basil’s cousin, Holy basil (aka Tulsi), is well known for its nervine properties. Not surprisingly, garden basil also has nervine properties and can promote calmness and clear thinking. Because of this ability, basil can be beneficial for stress-related headaches. Learn how to grow basil here. Oregano has a reputation among herbalists as a traditional lung remedy, and for good reason — like thyme (also revered for its role in lung health), oregano contains the volatile oil thymol. Both herbs were traditionally used as expectorants and to ease lung congestion. Used for topical application as well as enjoyed internally, oregano can help the body fend off fungal infections. You can learn more about oregano for nutrition and healing here. Yet another tummy-soothing carminative, lemon balm has a proven track record as a reliable mood booster with immune system benefits. It has been shown to have antiviral properties in laboratory and clinical trials (Hoffman, 2003), especially if used topically for viral-related skin problems. It’s a popular herb for children because of its pleasant flavor and good safety record, and many herbal mammas know that a cup of warm lemon balm tea and a hot bath for their little ones can help stop a cold or flu from setting in (it works for big people, too)! Although this herb has a wonderful lemony taste and many potential uses, you should avoid lemon balm if you have hypothyroid problems or are on thyroid medications. The next time you are faced with an abundance of culinary herbs and aren’t quite sure what to do with them, consider making an herb paste. Your taste buds and your health will thank you! If you are looking for ways to add more herbal inspiration to your recipe box, be sure to check out our Herbarium membership. 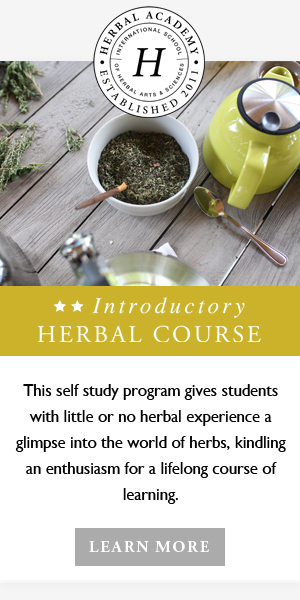 Our Cooking with the Seasons ebook is one of the membership perks, plus you will enjoy access to in-depth monographs and articles that will take your herbal learning to the next level, preview below.